Jack Skellington, the Pumpkin King, decided that he would take the place of "Sandy Claws" and give out gifts on Christmas Eve. Jack dispatched Lock, Shock and Barrel to capture Sandy Claws in their walking tub, and asked Sally to make him a red suit. But his "gifts" were scary, not cheery, and the world turned against him, knocking his sleigh from the sky. We alread had one Santa Jack, but that was when his suit was fresh and new - this is Battle-Damaged Jack, and boy does he look different! 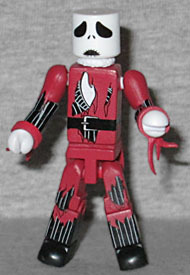 He's made from all the same parts (including the long skinny torso), but his red coat and pants have been shredded, revealing his black pin-striped suit beneath. He has the same tattered tails as the standard Jack, in red this time, and the ripped sleeves from the Pumpkin King. He no longer has fur trim around his wrists or boots, but there's a new collar piece (since his beard is also gone). 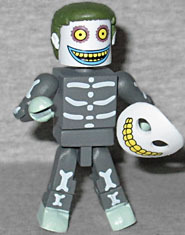 He gets a new dismayed face, which highlights one of the benefits of making NBX Minimates: every company tries to make variant heads for their Jack Skellington figures, but due to the way Minimates are made, it's rarely worked this well. You can swap them around between any of the Jacks! 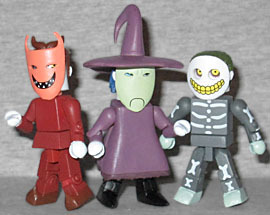 Lock, Shock and Barrel are one of my favorite gags from the movie: they appear to be three average trick-or-treaters, but when they take off their stylized masks, they all still look exactly the same! Lock seems to be the leader of the group, though he doesn't seem to have any special talent for it - he just likes giving orders. He dresses as a red devil, though it may be more than just a costume: the tail seems to move on its own in the movie, not just hanging straight down. His head is not the usual Minimate cylinder, but one that's 50% taller. 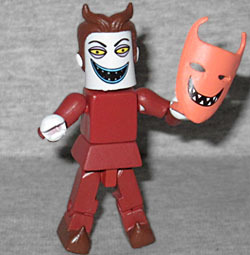 The real Lock has a pointy chin, but that's not the Minimates way. He's painted with bags under his eyes and sharp teeth between his blue lips. His mask fits over his neck peg, but the eyes line up with the holes perfectly! It's really impressive. Shock is the little witch, and seems to be the actual brains behind the trio - at least, the only one with at least a modicum of cunning. Like her... friends? Brothers? Co-henchmen? she uses the child arms and legs, though her feet are long and pointy (Lock's were short and curled upward). 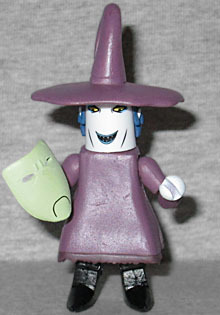 She wears a large purple dress and a tall hat, though that does cause some problems: again, her mask fits over her neck peg, but her dress is already adding some thickness over the torso, so when you've got the mask in place as well, it makes the head sit slightly too high, not fitting on the ball properly; plus, since the mask is now riding up, it pushes her hat up a skosh as well. Also, Shock's head really doesn't suit the Minimate format - in the movie, hers is even thinner and pointier than Lock's, but here it's the same shape. Minor complaint, though. Also, the traditional lack of a nose really hurts her: a big pointy nose is her defining trait, and here it's necessarily absent. On the other hand, it suits Barrel perfectly! He's the little skeleton boy, so he never really had a nose to begin with. He's the dimmest member of the group, but also the least malicious; he just tends to follow the others' directions. Once again he uses the child-sized limbs, though his feet are standard. In the movie they looked like claws or flippers, but there's no need for that here. His body is entirely grey, with bones painted on his limbs and torso. The Minimate head-shape works nicely for Barrel's round noggin, too. The red bits around his eyes make him look like a Dia de los Muertos candy skull - appropriate! 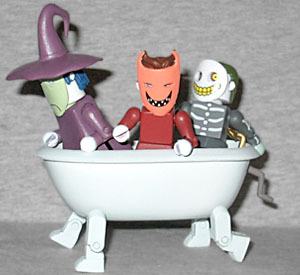 You can't have Oogie's Boys without their preferred mode of transportation, a walking bathtub. It's big enough to seat all three of them, and it has a fully sculpted faucet at the back. A hand crank even hangs off the rear of the tub. The legs are real Minimate legs (once again, with the child-sized shins), so they can move and be posed any way you like. No weapons or big bag for Sandy Claws, but this is still an excellent piece. This set was an NYCC exclusive, but I didn't know about it until after the show was over, so I couldn't ask anyone to get one for me. Fortunately, it was also offered through Previews - rather than paying scalper prices, you can just go to your local comicshop and order Item Code FEB158312. It's worth it to get the trio and their tub, with Jack as a nice bonus. This entry was posted in Art Asylum, Disney, MMMR and tagged Minimates, Nightmare Before Christmas. Bookmark the permalink.